“I don’t have iTunes on my computer. Found an MP3 ringtone and need to convert it to an M4R format. I know you can’t just change the extension. Is there an accessible site for this? Or is there an app? Thanks for your help.” – A question from a forum. Have you ever encounter such problem? People who are the enthusiast of iPhones might have been such issue. IPhone Ringtone is always an important and concerned part on the aspect of iPhone using. If you have the same problem on how to convert MP3 to M4R for iPhone Ringtone, This post will provide you with three simple ways to solve the problem. Part 1. Why people need to convert MP3 to M4R? Part 4. How to change MP3 to M4R with iTunes? Before we begin to convert MP3 to M4R, we need to know more about MP3 and M4R. MP3 is really familiar to us. MP3 is an audio coding format for digital audio. And it is one of the most common music file types for consumer audio streaming and storage, and the standard for the transfer and playback of music on most digital audio players. Since MP3 files are small, they can easily be transferred across the Internet. And M4R is an iTunes Ringtone file format, which is able to be created and transferred to an iPhone in order to use custom ringtone sounds. If you are a iPhone user, you may find that it is not easy to get free ringtones for your iPhone, unless you purchase the ringtones from iTunes store for iPhone. If you don’t want to buy ringtone from iTunes, and want to get free ringtone from other channels like the music downloaded from YouTube or the movie you like, convert the music to M4R format is necessary since iPhone ringtone format only supports M4R. Here I would like to recommend three simple ways to convert popular MP3 to M4R for making iPhone Ringtone. 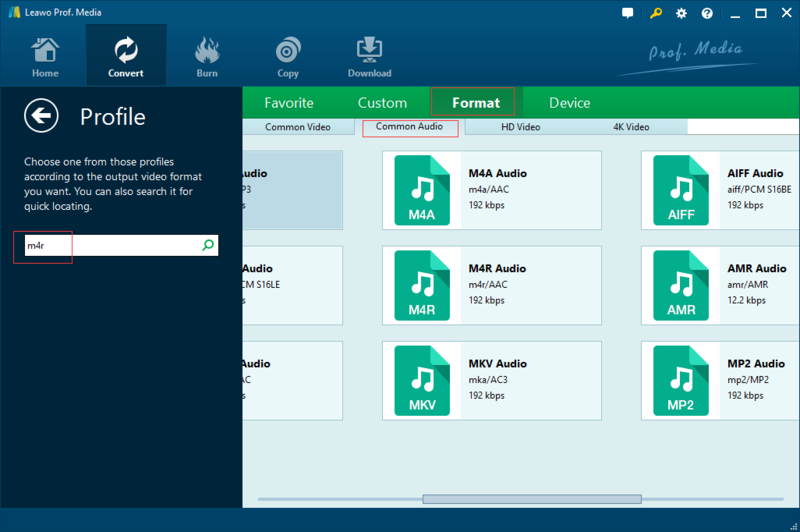 The first way to convert MP3 to M4R is to make use of Leawo Video Converter. Leawo Video Converter is regarded as a professional MP3 to M4R converter as it is able to convert MP3 to M4R at high speed without quality loss. Not only conversion of MP3 to M4R, it enable you to convert videos and audios between all popular formats like AVI, MP4, MOV, MP3, AAC, FLAC, etc. Besides, it has rich editing feature for you to set audio volume, add image/text watermark, rotate video for special angle. Let’s download and install Leawo Video Converter first and then follow the guide below step by step to convert MP3 to M4R. 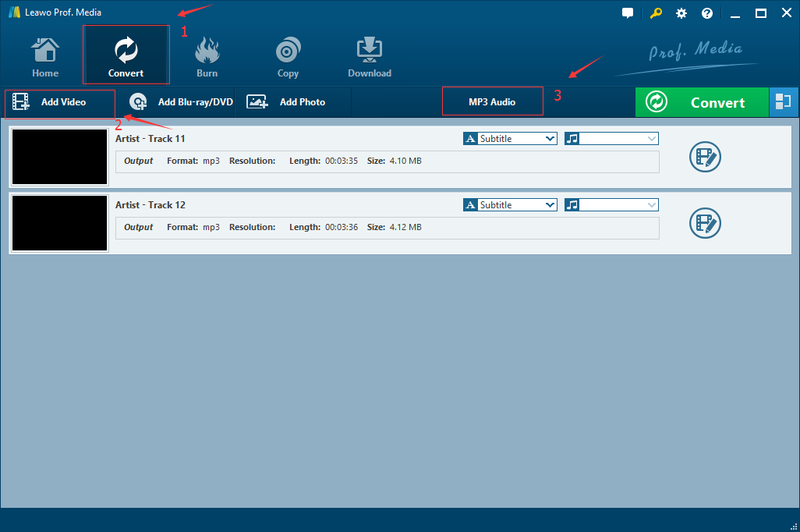 Step 1: Add your desired MP3 into the MP3 to M4R Converter. Click a drop-down box on the right of “Add Photo” button, and select “Change” option to choose “M4R” as output format from “Common Audio” tab under “Format”. Click the green “Convert” button, set output directory on the popup window, and then click the other “Convert” button at the bottom to start converting MP3 to M4R. Once the conversion finished, you will completely get the M4R files on your computer, then you can transfer to your iPhone for your iPhone Ringtone. If you think you want to try another way, please refer to the following MP3 to M4R ringtone converter online. 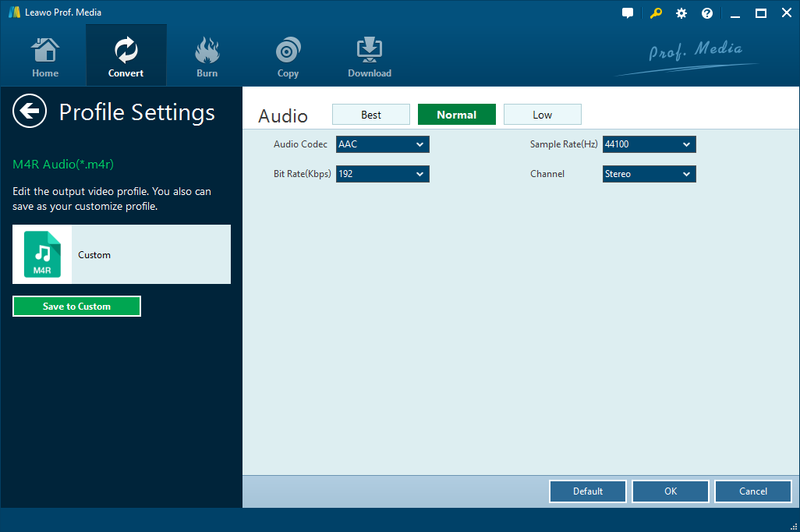 Apart from MP3 to M4R converter software like Leawo Video Converter, MP3 to M4R ringtone converter online is another way for you. Actually, there are lots of MP3 to M4R ringtone converters online for you to choose from. Here I would like to take convertfiles.com as an example. Convertfiles.com a free and simple online file converter that works with a wide range of file types, including document, archive file, spreadsheet, audio and video file. And it is convenient since you don’t need to download additional software. However, it works must in the occasion of on line. And it need a certain time to upload your files, after conversion, you need to download the converted files. Anyway, let’s give it a try by following the simple steps below. Step 4. When conversion is complete, your browser will display a message with a link to download the file. If you have downloaded iTunes, you can change MP3 to M4R with iTunes without other programs. The following step by steps guide will teach you how to change MP3 to M4R with iTunes for making iPhone Ringtone. Step 1. 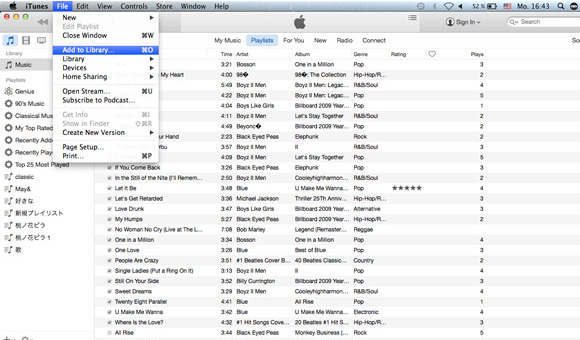 Run your iTunes and then import the MP3 songs you want to make ringtones for iPhone. It is recommended to make sure that your iTunes has been updated. Open it and then click “File” > “Add File to Library” or drag/drop MP3 files to add to iTunes library. After adding the MP3 music, you need to trim it to less than 40 seconds since iPhone will not accept longer music files as ringtones. 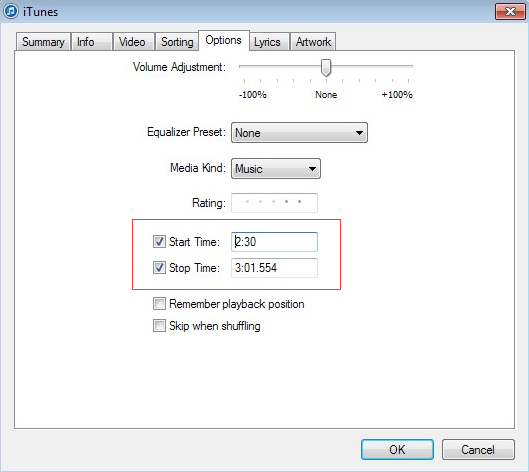 And then right click the MP3 file to choose “Get Info” > “Options” to specify the start time and stop time to trim long mp3 music song. 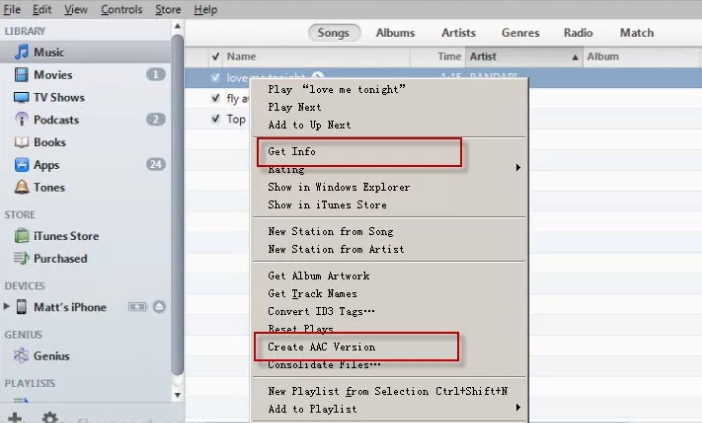 Right click on the MP3 file, select “Create ACC Version” from the pop-up menu. The MP3 files can be changed to M4A which will appear in the iTunes Music library. Click “Show in Finder”, then change the “.m4a” extension to “.m4r” to rename your M4A audio file to M4R audio. After getting M4R file, now you can sync ringtone from computer to iPhone. All methods mentioned above are able to convert MP3 to M4R for iPhone Ringtone. If you have downloaded an iTunes on computer and don’t want to download other program, you can convert MP3 to M4R with iTunes. If you have no iTunes downloaded, and you would not download programs, you can try online converter. But it has some shortcomings. For me, I prefer Leawo Video Converter, which is regarded as a best MP3 to M4R converter. Its superiority higher than others, for example, just with several simple steps, it can finish the conversion in high speed without any quality loss. It must be the better one.